Tuesday SOL: Is it already past? 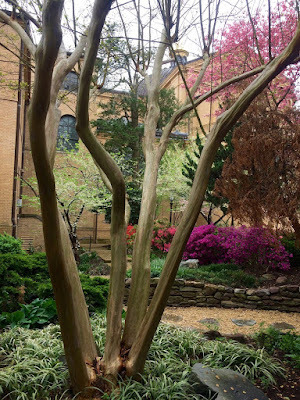 A beautiful spring at the Franciscan Monastery. My spring break was last week. For the first time in years, we stayed home. My husband is recuperating from minor surgery and therefore unable to walk long distances; it was not the time to be sightseeing and touring in some new locale. We managed to have the most delightful week, all the same. 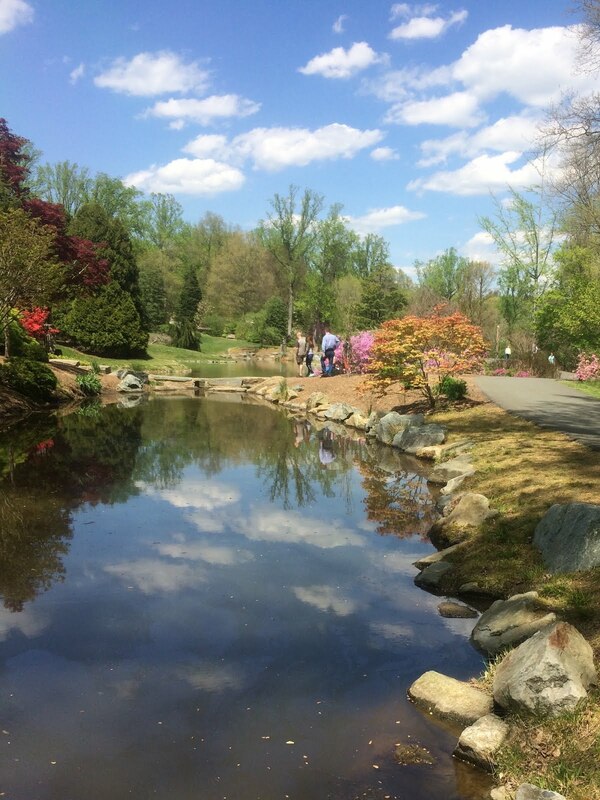 Of course, I live in the Washington, D.C. area, so there were many things to see and do very close to home. I'll share a few photos. My brother Ralph and his family visited for a couple of days at Easter, and I slipped down to tour some of the monuments with them and to paddle boats on the Tidal Basin. 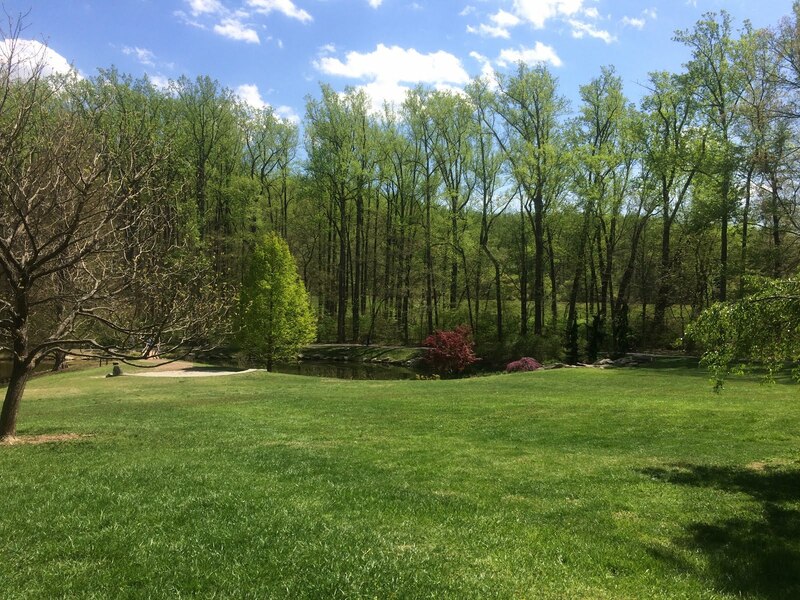 I visited the Franciscan Monastery for the first time, enjoying its tranquil, meditative grounds. On one perfect, irresistible spring day, Tony was feeling well enough to visit our local park (Wheaton Regional Brookside Gardens), and I walked the grounds while he rested on a bench. 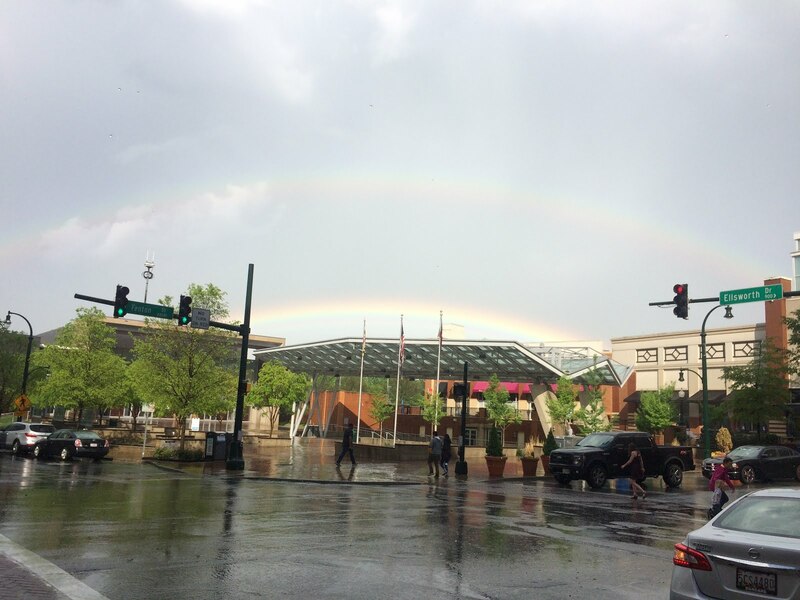 Our special week at home together ended with a powerful, surprise hail storm followed by a double rainbow. I'm sure there is some meaning to this finale! I realized, there's a surprising amount of relaxation and respite that comes with a "staycation." Simple walks around my neighborhood in the middle of the day seemed so peaceful and dear. Digging weeds out of my garden beds seemed both long overdue and low-pressured. Reading, journaling, and napping were three essential daily activities. Another example - I cleaned my classroom betta fish's aquarium...a task I had put off for so very long. When would I have found this hour, without a lot of down time all around it? Perhaps my most vivid example of the delightfully slow pace of a week at home - I often went on not one but two walks a day in my neighborhood. I had so many noticings...the quiet all around, the bright colored azaleas, the beautiful dogwoods, the dappled light under trees, the unexpected breezes. Is it possible that I hadn't done this since my children were little? When I returned home, I reflected in my journal...which, of course, resulted in this blogpost. Does it get any better than this, this delight of slow, found time? Yes, it was a fabulous week - and leisure was the rule. Here it is Tuesday, a mere 48 hours later. Is it already past? Wheaton Regional Park...you'll have to look very closely to find Tony on a bench! 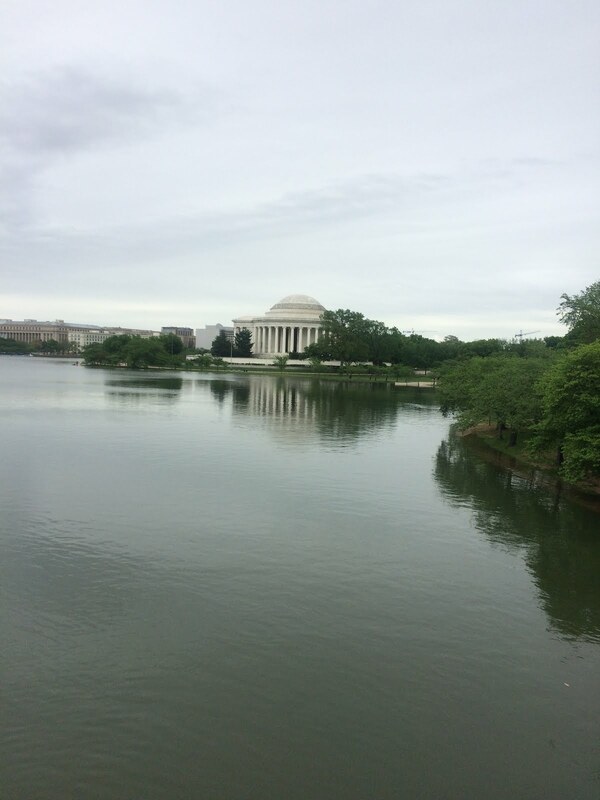 I loved the reflections of the Jefferson Memorial on the Tidal Basin. 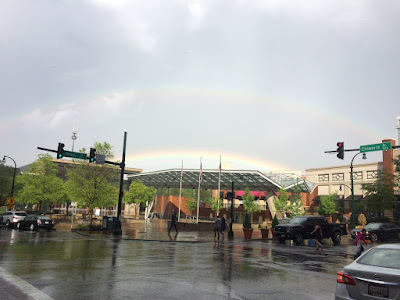 Tony and I headed out to a movie in downtown Silver Spring, and caught a double rainbow! 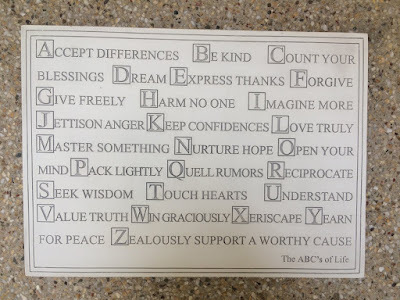 This teacher couldn't resist the ABC's of Life at the Franciscan Monastery. Tuesday SOL: What could be more fun? I am delighted to be on spring break and, thus, I will keep this slice short and sweet! Last week, our school celebrated "intersession," where our students work in mixed-age small groups on different topics over several days. 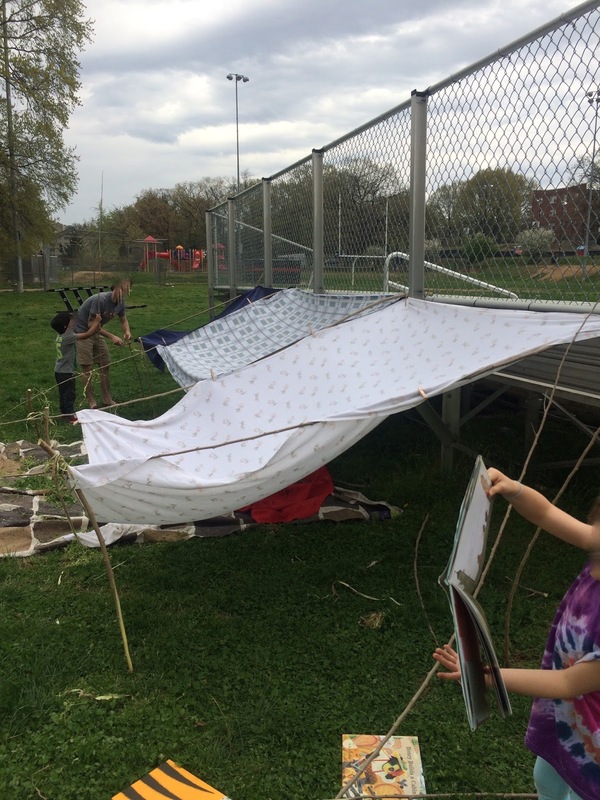 My small group was comprised of nine students, a mix of preschoolers through kindergarteners, and we built forts outdoors. 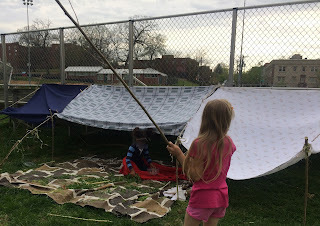 Hearing and seeing children's imagination run free - they created 'campfires' out of sticks and imagined a warm fire, they fought off invisible monsters, and they spontaneously shared stories about escaping, hiding, surviving...what if no one could see us? what would it be like to stay out all night? what if we lived here for real? It was so fun to hear their imaginative ideas. 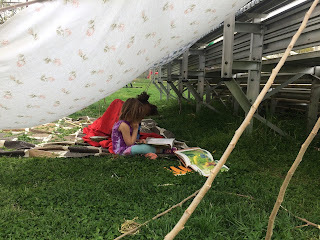 One day, we had a light rain - but we sat protected under our roof of sheets, all cozied in together, enjoying books and telling stories. It was a very special few days of fun times outdoors, creating together. Tuesday SOL - Have you noticed me? I stepped out of a workshop called "Building a Trauma-Informed Classroom," and into the metro underground. My head and heart were filled with information. They had just stepped through the metro turnstiles, coming towards me. She appeared to be a young mother, certainly no more than 20 or 21. He was running alongside her, scampering in that unpredictable way that a two year old does. I started to smile at his sweet look. She yelled to him, "You better #$@&%*! -ing stop! I am sick of you! What the #$@&%*! you think you're doing?" I averted my eyes. ACEs are those stressful, perhaps even traumatic factors that children are just born into, through no fault of their own, that will trouble them all their life: parents or caregivers who abuse drugs or alcohol, have a bitter divorce, become incarcerated, suffer acute health issues, practice emotional or physical abuse, live in acute poverty, suffer unemployment or homelessness...there are innumerable ACEs. 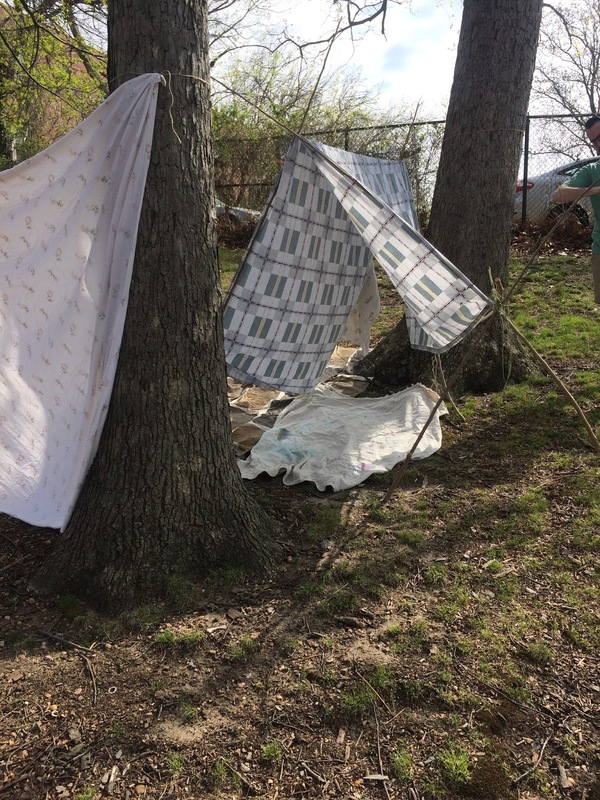 According to the workshop leader, Dr. Megan McCormick-King of Insite Solutions, 37% of D.C. kids have at least one ACE; 11% of D.C. kids have four or more ACEs. The risk of developmental delays is more acute in children with four or more ACEs. Further, the risk of early death is more likely with four or more ACEs. 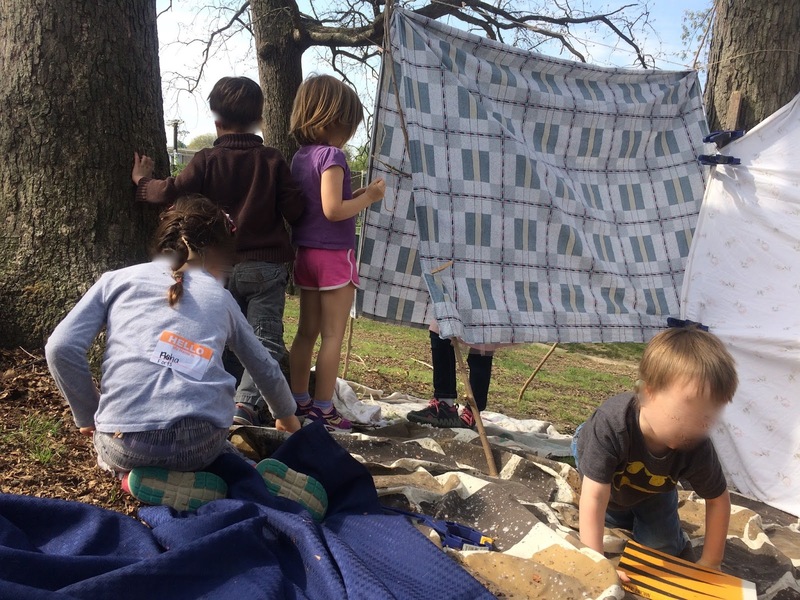 Create opportunities for "Serve and Return" - the simple back and forth between a child and caregiver, allowing the child to 'serve' an idea and, allow me - the caregiver - to meet the child right there at that idea, and converse about it, play along...let the child lead. When I see those challenging behaviors - consider for a minute, what 'Serve and Return' behaviors are not being met? Is the child acknowledged/noticed/seen on the most basic level? Be sure to acknowledge children, to send the consistent message - "I see you, I hear you." Help children build strategies for waiting and soothing, such as deep breathing, taking a break, having a safe space. It was a fabulous workshop...this one small slice hardly does it justice. Let me circle back to the young mother in the metro, yelling at her small child. I averted my eyes, speechless, stunned, feeling raw from the workshop. Right behind me was a young man, all of about 14 - and he spoke up. He yelled "Stop speaking to your child like that!" She quickly retorted, "Shut up!," and kept walking the other direction, but I wonder if he planted a seed. 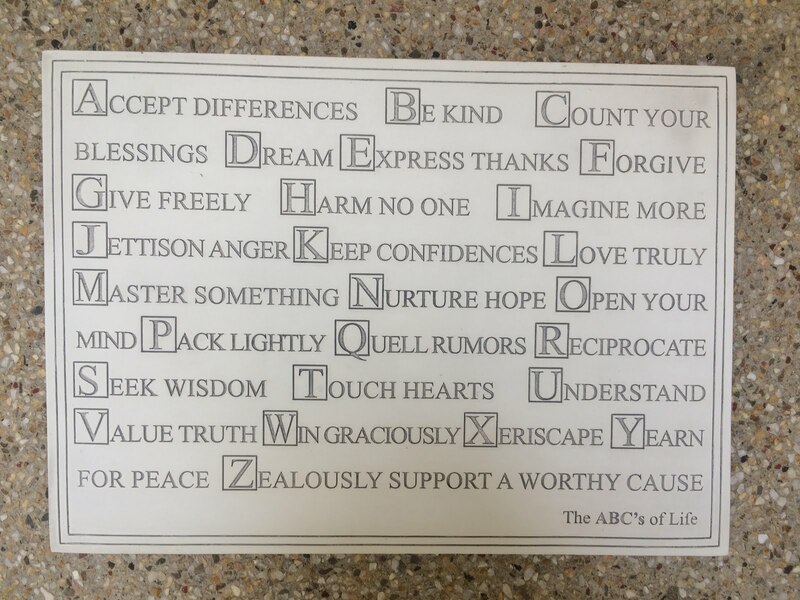 This left me hopeful, too. It takes everyone of us, paying attention to our young children.